Why is everything gender specific these days? POP! Did y'all hear that? That's the sound of many Hello Kitty fanboys' hopes fizzling out. There goes the plan to stop stereotypes for male Sanrio fans. Wouldn't this be harder for more of the mainstream society to accept guys liking Hello Kitty? I feel a little bad, too, at times forgetting that there are guys out there who are Sanrio fans. When I write, I tend to generalize and assume my readers are females. Also, I have to point out that one of Sanrio's agenda goals is to hook most girls into becoming Sanrio addicts from a young age and to pass the obsession to their future daughters. Unfortunately, this further continues the stereotype that Hello Kitty is only for children. So, my question to Hello Kitty fans all around the world, is there a good mature way of fighting this stereotype without resorting to name calling and calling non-fans haters? I recently attended the American International Toy Fair, a massive event at the Javits Center in New York City featuring more than 1,000 companies showcasing the latest in games, toys, crafts, stuffed animals and dolls. This is my third year going to the Toy Fair, and in addition to seeking out what I think are the best new products for kids, I also visit the Toy Fair to find out what the latest trends are in the industry, usually both for better and worse. Toys are more gender-specific than ever. For example, it’s rare to see a toy that is 50 multi-colored building blocks. Now, it’s 50 pink blocks and a princess figure or 50 blue blocks and a policeman. It may be what’s best for the toy manufacturers, but I’m doubtful it’s what’s best for the child. There aren’t as many stand-alone toys as there used to be. This year, the majority of toys being promoted as a company’s top seller were so because they featured a popular TV show, movie or beloved character. It’s not that I don’t love Hello Kitty, but I’m not sure it adds anything to a baby’s teether. The company with the costumes featured above did have one superhero outfit for girls that I saw: Robin, of Batman and Robin fame, complete with a tutu. Since the moment a few years back that I was completely confused as to why a McDonald’s Drive-Thru attendant asked me if I wanted a boy or girl Happy Meal (unrelated to the gender of the animal from whence the food came, I subsequently learned) I have had a heightened awareness of how the toy industry is increasingly dividing boys and girls in ways I really thought we got past in the 70′s . That was when the first toy I remember really desperately wanting was an Evel Knievel Stunt Cycle. It was also the first toy that made me realize all toy ads lied about how good their crappy toys were. But that’s another story. The thing is, despite all my frustration and disappointment with the boy/girl toy separation, despite all my awareness, I am 100% totally guilty of it too. We walk into a toy store to get Thalia’s friend a birthday gift and while I tend to gravitate toward crafty gifts, I automatically look at the jewelry box-painting sets or friendship bracelet kits. Not that there’s anything wrong with that. My girls would make Rainbow Loom bracelets until dawn if I let them (and so would plenty of boys by the way). But I don’t necessarily peruse the science experiment kits, the microscopes, or the Lord of the Rings LEGOs for her 9-year-old girlfriends, despite my own girls being card-carrying graduates of the school LEGO Builders Club and Science Experiment Club. I realize I don’t ask that question quite so often if we’re buying gifts for boys. Nor do I ask whether Caleb would enjoy a Rainbow Loom. So what the heck is going on when I have to mentally push myself out of the pink tutu mindset to shop for girls who aren’t my own? It’s kind of disheartening when even parents like me, who should know better, get stuck in this stereotypical rut. I even see evidence of it on Cool Mom Picks–we can feature a gender-neutral red and blue felt crown from an Etsy artist which will get a ton of love on Pinterest. But show the same one in pink with little bunnies on it–the shop sells out its stock. I was thrilled that there were actually a few smart toys for girls that defy the pink aisle which I wrote about, including Alma Loveland‘s awesome Attatoys Mixmates blocks. (I didn’t once have to say “or girls” when we talked, or anything!) I’ve met her a few times at conferences, and I’m so thrilled that she’s got a potential home run on her hands for all kinds of kids. However her kind of thinking was exceedingly rare at a show with more than 1000 exhibitors, some of which should know better. Which is not the right answer. I was shocked. And so was Christina who is my witness to this all, and fellow concerned mom-of-girls. So I asked my friends and followers on Twitter what their daughters want to be when they grow up. I think the answers are wonderful, diverse, and fascinating. @kathyinalaska: My 6yo wants to be a ballerina or an FBI agent. @wandsci: A teacher and a doctor (this week). The one who wants to be a teacher says she’ll also write books. @stefaniya: One wants to be a scientist, the other wants to own a tea shop and sing in a band in her free time. @monabenach: first woman to play professional baseball. @WellVersedMom: My daughters’ choices have been marine biologist, pilot, singer, architect & graphic designer. @redshutters: Mine wants to be veterinarian, ballerina & doctor–sky’s the limit for her! @jenrenpody: a dancer & an artist. I blew her mind when I talked to her about dance itself being art. She loves to create, and she’s 6. @Nosepicked0811: happy #1. She wants to be an astronaut on Monday, scientist Tues, fashionista/boutique owner Wed, & world traveler the rest. @mheschmeyer: Broadway actor, broadway actor, and pediatrician. @ChaosRu: One of the first people to go to Mars. Also an engineer. @ttsiegel: A singer/artist/astronomer (C, age 4 1/2); a teacher/mommy (E, age 4 1/2). @kristins4kids: 1-music teacher or author; 1-lamb farmer or music teacher; 1-figure skater. @cuizoo: Just asked. She is unsure at this point, but is completely sure she doesn’t want to be a model or a ballerina. Now granted, this is not scientific research in the least. If I passed it off that way, every strategic planner I’d ever worked with would unfriend me instantly. My readers may be more progressive than most–and it’s possible that the parents with girls who want to be models and fashionistas didn’t respond. Still, if you look at the answers, there are definitely a few ballerinas and mommies in the bunch. There are singers and actresses and (adorably) a babysitter. And hey, I’m all for girls wanting to be princesses. Or pop stars. But the aspirations for girls don’t end there. So why do girls’ toys? The problem with the ballerina-fashionista dolls I saw isn’t that such a thing exists; it was creative, technologically speaking, and will probably be very successful. The challenge as I see it is the company so takes for granted that this is what a girl toy is, that they wouldn’t even think to prep a PR person for any potential questions about why. Now I also spent a lot of time in the LEGO booth at Toy Fair too. (I have never done business with them; I just like LEGOs.) And while they have gotten a lot of flack for LEGO Friends over the past year, I stand in defense of them. Whether the bricks are pink or red or black, they all interlock, they all work together, and they get girls building even when they are all but ignored by other companies. I realize that girls do play with toys differently than boys do. And I know that are girls who would rather play with a hair stylist than a LEGO City police officer or Tauriel the Elf. So I appreciate that they’re all made available–and should your kid wants to stick a sword in the hairdresser’s hands (battle with evil competitive alien hair salon?) she can. And yet, our only choice as parents isn’t boy or girl at all. It’s blocks or cars? Expensive or cheap? Big or small? Building or crafts? Science or poetry? Animals or robots? The list goes on. 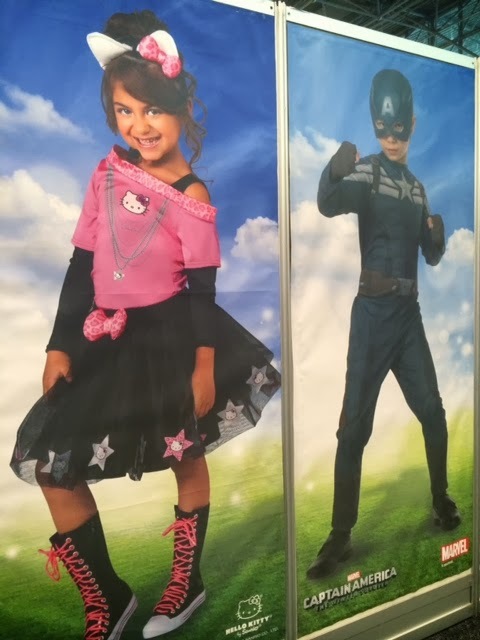 Interestingly, the company with the gihugic costume display at Toy Fair that you couldn’t miss to save your life, featured the tagline, Dream. Believe Achieve. I would love them–along with any marketer, salesperson or distributor who has ever employed the sentence And for boys we have…. in a pitch–to stop a moment and consider exactly what they think they are encouraging children to dream and achieve. And I’d love us as parents to consider the same thing. Especially when we automatically drop a Make-Your-Own Sparkle Lipgloss Kit in our carts instead of a telescope.